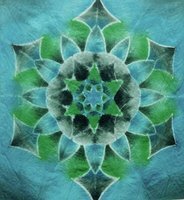 Explore the endless possibilities of mandalas in this contemporary shibori workshop, in which you’ll use colorful dyes to create eye-catching patterns for pillows, quilts, and other projects. Please wear studio clothing and bring rubber gloves, scissors, and a seam ripper. All other materials will be provided. $72 members, $90 non-members, plus $40 materials fee due to instructor at beginning of class (cash only). Limited to 20 participants. Museum admission included. In the Koichi & Toyo Nerio Education Center. Check janm.org for updates. JANM . Última actualización Ene 09 2018 3:14 p.m.